Three new products lead the pack in the latest innovations to be introduced in the sign, graphics and visual communications industry. The ISA Sign Expo 2018 Innovation Winners reward groundbreaking products in business solutions/software; electronic and traditional signage; and print. In all, 54 products were entered in this year’s competition. All will be displayed on the tradeshow floor at ISA International Sign Expo 2018. The full list of nominated products is available at http://signexpo.org/innovation. Business Solutions/Software: Cirrus Systems’ SIGHT. This offers digital analytics reporting that allows marketing teams to track and optimize the effectiveness of digital display campaigns. The scalable, web-based software works with any digital display to create, manage, and track the results of marketing content easily. Nextgen features like car counting and face tracking with Cirrus SIGHT open new opportunities for measuring success, A/B testing and attracting new customers. Electrical and Traditional Signage: Component Signage’s INCISEON Skeletonized. This 12v direct replacement for glass tube neon has received both a UL Listed and a UL Sign Accessory designation, making it widely adaptable for any neon retrofit or neon-look project, and making it extremely easy for anyone to install. For 2018, INCISEON is introducing tube coated colors, advancing the color selection of the Skeletonized product line to 26 standard colors. Print: Mimaki USA’s UCJV300-160 UV-LED cut-and-print device. The UCJV300-160 model is the only 60-inch class UV printer offering in-line cutting capability and featuring white ink to enable four-layer printing. It allows the creation of stunning transitional backlit panels that morph color schemes with the light source. Users can print and cut or cut first then print labels, decals, window clings, vehicle markings, etc., all on one unit. Flexible UV cure inks expand the possibilities to offer unique capabilities to maintain competitiveness. The three winners will present brief overviews of their products and be honored at a reception at the Lounge & Learn area of the tradeshow floor during ISA International Sign Expo. That event occurs at 4 p.m. March 22. 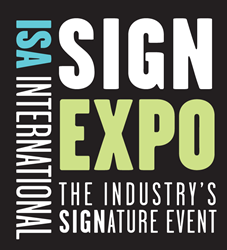 ISA International Sign Expo is the on-premise sign and visual communication industry’s largest expo. Held each spring, the event features the latest products that showcase the breadth of the sign and visual communications industry along with education and networking events. The event has been named to the Trade Show News Network’s List of Top 250 Trade Shows and ranked in the Top 100 Largest Events by Trade Show Executive three consecutive years. Learn more at http://www.signexpo.org.